Roy Lee 'Father' Lumpkin was a running back who played college ball at Georgia Tech. In 1929 (during his sophomore season), Lumpkin led the Golden Tornados to an undeafeted record capping it off with a victory over California in the Rose Bowl. 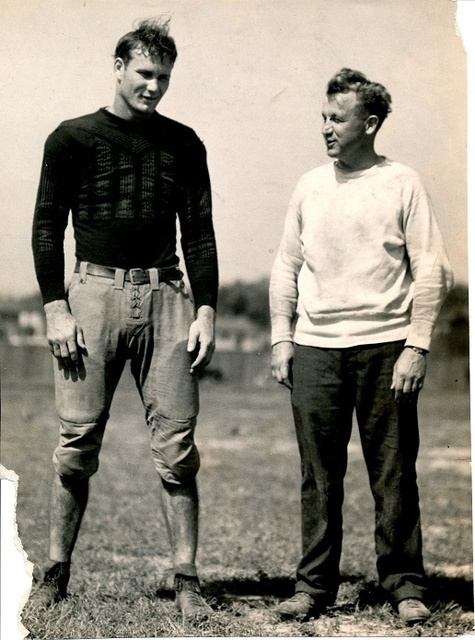 Lumpkin left Georgia Tech and joined the Portsmouth Spartans in 1929. He came the star of the semi-professional Spartans and elected to stay with the team even as they moved to Detroit. Lumpkin earned a reputation for being a fantastic blocker- and for also being one of the last players in the NFL to agree to wear a helmet. Coach Clark was hired in 1931 by Manager Harry N Snyder. Clark succeeded Hal Griffen, who had resigned a couple months previously. Griffen had led the team to a pedestrian 5-6-3 record and eight in the standings out of eleven NFL teams. Clark was brought on to teach his players discipline and toughness. Clark ran the team for three successful seasons before it was bought by radio executive George Richards and moved to Detroit. He stayed with the team, though, and coached them as they won the championship in 1935.